Shown $44.99Baskets are designed to be delivered as close to the plant basket pictured as possible. Premium $64.99With even larger plants, the premium selection makes quite a statement. Delicate decorative violets adorn this charming country basket, abounding with the sweetest array of flowers that a pretty pasture could offer. Stop by the a countryside road and pick those favorite luscious violet blooms and taken them away into a place in your heart. 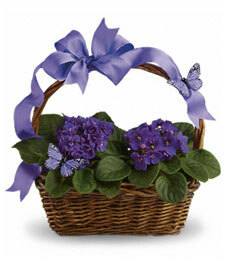 My Violet Blooming Garden is the perfect gift for that special someone on any occasion!